Preschool education is education that focuses on educating children from the ages of infancy until six years old. The system of preschool education varies widely, with different approaches, theories, and practices within different school jurisdictions. The term preschool education includes such programs as nursery school, day care, or kindergarten, which are occasionally used interchangeably, yet are distinct entities. While pedagogies differ, there is the general agreement that preschool is responsible for providing education before the commencement of statutory education. The proliferation of preschool education in the twentieth century can be connected to advances in developmental psychology, such as in the work of Jean Piaget which revealed the nature of psychological development that occurs in the early years of childhood, and from the educators such as Froebel who recognized that children need stimulation, particularly that provided by play and role playing, from a young age in order to develop their full potential, as well as from the needs of large numbers of working mothers to provide a good environment for their young children during working hours. Thus, preschool environments vary depending on whether their main focus is care of the children such as in a daycare program, which nonetheless acts as a socialization experience that extends beyond the family and prepares the children for school, and those which were specifically designed to provide early educational experiences for young children, such as the kindergarten. While it can be argued that young children do not need these experiences as the family should be their primary learning environment, for many children a preschool environment offers experiences, educational, social, and other basic needs that unfortunately may not be satisfied in the home. Preschool education, thus, is a vital component of the development of many young people. Given the importance of the youth of any society for its future, investment in such programs, together with investment in the families who are the primary caregivers and first teachers of their children, can go a long way to support the development of good citizens for the future. In the nineteenth century, several European educators, including Robert Owen of Great Britain, Johann Heinrich Pestalozzi of Switzerland, Friedrich Froebel in Germany, and Maria Montessori of Italy began to develop educational systems designed for early childhood in the hope of actively helping children during one of the most crucial stages in human development. Robert Owen was responsible for creating the New Lanark school for young children, most of whom were from the poor workers in Owen's cotton mills. His school was successful, and spurred similar institutions in England. Froebel came up with the term "kindergarten" (meaning "children's garden") and created the first kindergarten school. Froebel believed that human beings were given almost limitless potential from God and saw kindergarten education as a means to start the process of realizing such potential at an early age. His curriculum focused on giving children the freedom to discover their abilities and personalities without forcing pre-determined self-images upon them, supporting the development of creativity, language, and social skills. Froebel's kindergarten program was spread by a number of teachers he trained, including the sisters Bertha Meyer von Ronge and Margarethe Meyer Schurz in Europe and America, although their programs were still taught in German. Elizabeth Peabody and Susan Blow developed English kindergarten curricula in the US, where the "kindergarten" became part of required elementary education beginning at age five. However, in 1965, the Head Start program was initiated as part of President Lyndon B. Johnson's "War on Poverty." This program provided early pre-school education opportunities to children of low income families, providing health and nutritional services as well as learning opportunities. While the German idealism and Christian aspects that Froebel and other early preschool educators advocated were not as popular in secularly run educational systems, nonetheless the core principals were widely understood and beneficial to helping child development and a more educated public. Generally, however, preschool education is a matter of choice; formal, state mandated education beginning with entry into elementary school. Early childhood education (ECE) is a pedagogical approach covering the education of children from the period from birth to six years of age. Physical development - Concerning the physical growth and the development of both gross (such as walking) and fine motor (such as finger movement) control of the body. A wide array of educational philosophies circulate through the field in regards to how best promote healthy development in these areas. Some professionals adhere more closely to a behaviorist theory based on the work of those such as John B. Watson, B. F. Skinner, and Edward Thorndike. Others hold to the more unstructured maturationist theory popularized by Jean-Jacques Rousseau and Maria Montessori. Additionally, stage theories such as those of Sigmund Freud and Erik Erikson are used to look at social and emotional development. Many early childhood teacher education programs teach a mix of theories dominated by the constructivist approach put forth by Jean Piaget and Lev Vygotsky. Regardless of the theoretical underpinnings, in practice early childhood education is largely child-centered education. Therefore, there is a focus on the importance of play. Play provides children with the opportunity to actively explore, manipulate, and interact with their environment. It allows children to experiment with the world around them and the emotional world inside them. To many it might seem like mere entertainment, but during such activities progress takes place in skill building, problem solving, overcoming physical and mental challenges, and so forth. Playing with products made especially for the preschool children helps a child build self confidence, encourages independent learning, and clears his concepts. For the development of their fine and large or gross motor movements, and for the growth of the child's eye-hand coordination, it is extremely important for him to 'play' with the natural things around him. It encourages children to investigate, create, discover, and motivate them to take risks and add to their understanding of the world. It challenges children to achieve new levels of understanding of events, people, and the environment by interacting with concrete materials. Hands-on activities create authentic experiences in which children begin to feel a sense of mastery over their world and a sense of belonging and understanding of what is going on in their environment. This use of play follows from Jean Piaget's idea that children should actively participate in their world and various environments so as to ensure they are not 'passive' learners but 'little scientists' who are actively engaged. The different preschool environments cover those in which education is the main focus, such as kindergarten, to those in which the function is basic care of the young child, such as Daycare. Regardless of the level of overt educational goals, however, children in these environments develop social skills as well as developing familiarity with a situation in which the child is separated from his or her parents for an extended period and must spend time in the company of peers who are not their siblings. When the child learns these skills successfully, preschool education plays a valuable role in preparing the child for school. Preschool programs also may focus on aspects of health, nutrition, and hygiene that may be lacking in their home environment. Again, these experiences are part of socializing the child into the larger community. Programs such as Head Start were designed with these aspects as specific goals. Day care or child care is care of a child during the day by a person other than the child's parents or legal guardians, typically someone outside the child's immediate family. The service is known as "child care" in the United Kingdom and Australia and "day care" in America. Child care or day care is provided in nurseries or creches or by childminders caring for children in their own homes. Child care or day care is ongoing care during specific periods, such as the parents' time at work. Child care can also take on a more formal structure, with education, child development, and discipline falling into the fold of services. Where the market is sufficiently large or there are government subsidies for daycare, for-profit corporate day care exists. In North America, Bright Horizons Family Solutions is one of the largest such companies. It is a publicly traded company operating over 600 daycare centers. The Australian government's childcare subsidy has allowed the creation of a large private-sector industry in that country. ABC Learning Centres is a publicly traded company running about 1000 daycare centers in Australia and New Zealand and another 500 in the US. Another factor favoring large corporate day cares is the existence of childcare facilities in the workplace. Large corporations often do not handle this employee benefit directly themselves and will seek out large corporate providers to manage their daycares. Most smaller for-profit day cares operate out of a single location. Non-profit day cares have some structural advantages over for-profit operations. They may receive preferential treatment in rent, especially if they are affiliated with a church that is otherwise unoccupied during the week, or with a school that has surplus space. Location within a school may further bring the advantage of coordinated programs with the school and the advantage of a single location for parents who have older school-age children. Parents are typically the legal owners of the non-profit day care and will routinely provide consulting services (for example accounting, legal, human resource) for free. Non-profits have an advantage in fund-raising as most people will not donate to a for-profit organization. Non-profits, however, are typically limited in size to a single location as the parent-owners have no motivation to manage other locations where their children are not present. They may suffer from succession issues as children grow and parents leave the management of the day care to others. Local governments, often municipalities, may operate non-profit day care centers. Home day cares are operated by a single individual out of their home. This is often a stay-at-home parent who seeks supplemental income while caring for their own child. Home day care providers may also be certified. Local legislation may regulate the number and ages of children allowed and subject the home to more stringent safety regulations before it is considered an official day care center. As home day cares do not pay rent, they are typically less expensive than day care centers. Local legislation may regulate the operation of day care centers. The legislation will define what constitutes a day care (so as to not regulate individual baby sitters). It may specify the physical facilities (washroom, eating, sleeping, lighting levels, and so on). The minimum window space may be such that it precludes day cares from being in a basement. It may specify the minimum floor space per child and the maximum number of children per room. It may mandate minimum outdoor time (for example two hours for programs six hours or longer). It may mandate staffing ratios (for example 1:3 for under 18 months, with higher ratios for older children). Legislation may mandate qualifications of supervisors. Staff typically do not require any qualifications but staff under the age of eighteen may require supervision. A nursery school is a school for children between the ages of three and five, staffed by qualified teachers and other professionals who encourage and supervise educational play rather than simply providing childcare. In some jurisdictions the provision of nursery school services is on a user pays or limited basis while some governments fund nursery school services. In the UK, pre-school education in nursery classes or schools is fully funded by the government and is generally available to children aged over three. Pre-school education can be provided by childcare centers, playgroups, nursery schools, and nursery classes within primary schools. Private nursery education is also available throughout the UK and varies between structured pre-school education and a service offering child-minding facilities. In the United States, nursery school is provided in a variety of settings. In general, nursery school is meant to develop children through planned programs, rather than simply caring for the child in a daycare environment. Kindergarten (German, literally means "children's garden") is a form of education for young children which serves as a transition from home to the commencement of more formal schooling. Children are taught to develop basic skills through creative play and social interaction. In the United States (and Canada) kindergartens are usually administered in an elementary school as part of the educational system (the K in K-12 schools). Children usually attend at ages five to six but in some states they may start as young as four. Kindergarten is considered the first year of formal education although the child may have gone to pre-school/nursery school. It is, however, considered a grade, and not an optional pre-school experience. In most countries, kindergartens are not part of compulsory education, although in some they may be government run, and attendance may be required when children reach a specified age. Kindergarten St. Michael in Bietigheim. The original German Kindergarten (plural Kindergärten) is not part of the actual school system. The term Vorschule, meaning 'before school,' is used for educational efforts in Kindergärten, which are handled differently in each German state. Children between the ages of three and six attend Kindergärten, which are often run by city or town administrations, churches, or registered societies that pursue a certain educational goal, e.g., as represented by Montessori, or Reggio Emilia. Kita (short for Kindertagesstätte), meaning children's daycare center, as they are frequently called, can be open from 7 A.M. to 5 P.M. and may also house a Kinderkrippe, meaning nursery school, for children between the ages of nine months and two years, and possibly an afternoon Hort (normally associated to a primary school) for school-age children aged six to ten who spend the time after their lessons there. In Israel, a fully developed kindergarten (or Gan) system has been developed to cope with the extremely high percentage of working women in society. There are two streams, private commercial and state funded. Attendance in kindergarten is compulsory from the age of five years. Private kindergartens are supervised by the Ministry of Education and cater for children from three months to five years. They cater for children from three to six years in three age groups; ages three to four (Trom Trom Hova), four to five (Trom Hova), five to six (Hova). At the conclusion of the Hova year (five to six) the child will either begin primary school or will repeat the Hova year, if not deemed psychologically and cognitively ready for primary school. In Morocco, pre-school is known as école maternelle, Kuttab or Ar-Rawd. State-run, free maternelle schools are available throughout the kingdom, welcoming children aged from two to five (although in many places, children under three may not be granted a place). It is not compulsory, yet almost 80 percent of children aged three to five attend. It is regulated by the Moroccan department of education. 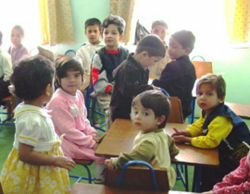 In Afghanistan, the equivalent term to kindergarten is کودکستان, pronounced as kudakistan (kudak – means child and stan – means land) and is not part of the actual school system. Children between the age of three and six attend kindergartens which are often run by government. In China, the equivalent term to kindergarten is (幼兒園), pronounced as you er yuan. Before Kindergarten, children may go to nursery for two years. At the age of four children begin Kindergarten and attend until age six. 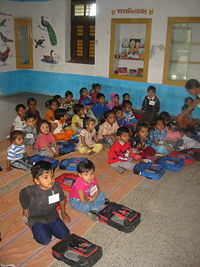 In India, pre-school is divided into two stages - lower kindergarten (LKG) and upper kindergarten (UKG). Typically, an LKG class would comprise children three to four years of age, and the UKG class would comprise children four to five years of age. ↑ Friedrich Wilhelm August Froebel Encyclopedia of Education. (The Gale Group, Inc, 2002). Answers.com Retrieved October 31, 2007. ↑ nursery school The Columbia Electronic Encyclopedia, Sixth Edition. (Columbia University Press, 2003) Answers.com. Retrieved October 31, 2007. Meisels, Samuel J. 1995. Performance Assessment in Early Childhood Education: The Work Sampling System. Urbana, IL: ERIC Clearinghouse on Elementary and Early Childhood Education. This page was last modified on 29 April 2017, at 22:18.